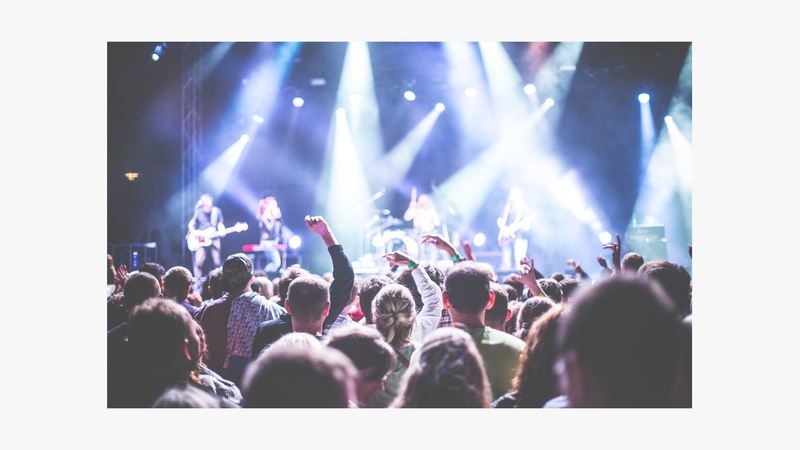 With CrowdSearch, the telco 3 takes centre stage at Roskilde Festival by connecting users like never before. 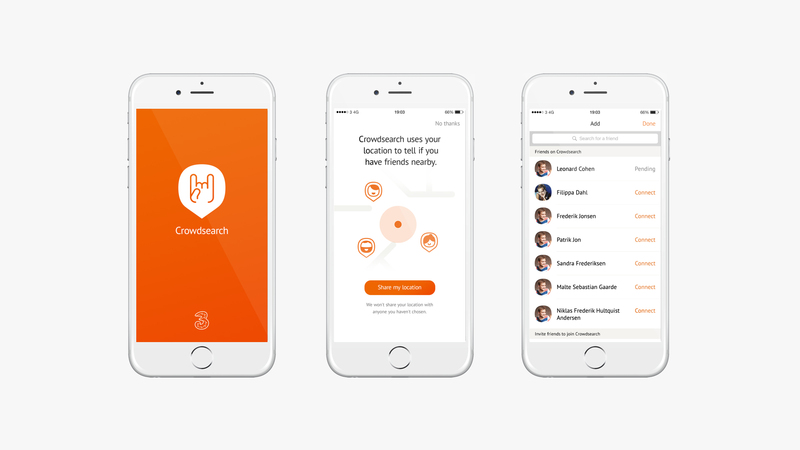 CrowdSearch is a geolocation mobile app coupled with advanced back-end becomes the go-to service at Roskilde Festival by helping concert goers find each other among hundreds of thousands. The App Store top spot was achieved within days. For one week every year 100,000 people spread out over fields of tents, stages and concession stands at Roskilde and nearly everyone at some point is in search of the same thing, their friends. At a festival with so many demands on your attention, the process of finding someone by calls, texts, etc. is exhausting. The telecom company 3 and their advertising agency Revolt came up with CrowdSearch, so users would stop searching for lost friends and get back to enjoying the music. To make it clean, a custom map was chosen as the main UI. This meant applying a grid of separate geolocations to the entire festival area. Pulling from Roskilde’s timetable, we established events for all music concerts to match locations. Friend lists were loaded via Facebook Connect and from user contact lists while a tracking algorithm was built with the native iOS application to register your location. We applied a CMS for handling on-the-fly program changes and back-end server support for push notifications towards friend requests and mass-communication. 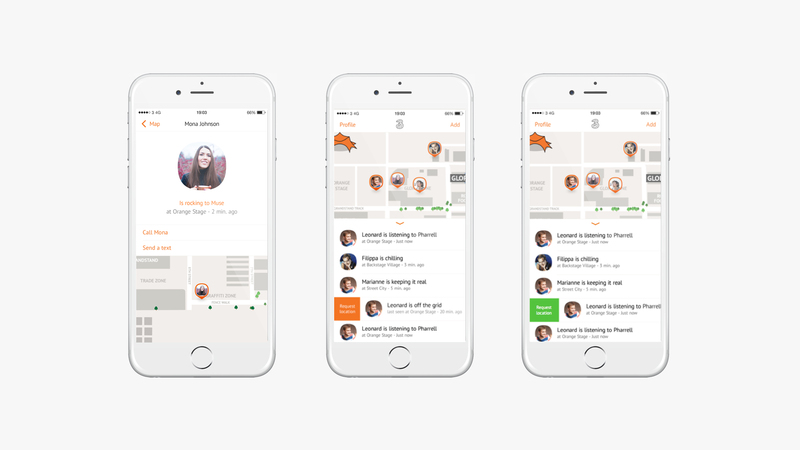 For the latest version, friend location requests and interactive social sharing were added to the mix. Crowdsearch was the go-to app for Roskilde attendees in 2015-2016. More than 30,000 festival goers downloaded the app within just a few days, pushing it to the #1 spot in the Danish App Store. An impressive amount of those users elected to share their contact information with 3 to take part in future promotions. Analysis of the data during the festival is being used to ensure better mobile coverage and customer service moving forward.